A long, long time ago I bought these at Michael's because I wanted to use them for my Light Message art that is emerging from my soul. Well I finally got around to actually doing something with them. Buckle up, it's a long ride (wink, wink). I began by ink spraying a circle stencil with Tsukineko Walnut Inks and then used a clear gesso on top. The more I brushed, the more the stencil smeared so I varied it. Unfortunately, I was not happy but continued and added more spray and bubble wrap with acrylic paint, which I didn't like either, but I still proceeded, because I'm not a quitter. 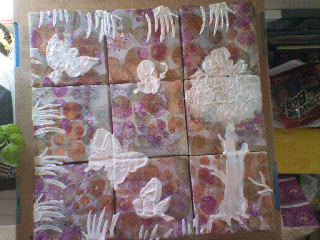 I then stenciled some images using Gesso. You lay the stencil down and use Gesso to fill in the space. See the background...it was too muddy, too dark. I was not happy. I then painted the stencils and used gesso to try and make the background disappear. It didn't work. I hated it. 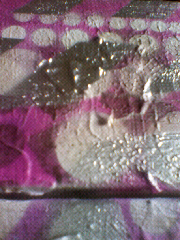 Every time I walked by it I wanted to cover it completely with gesso, which I eventually did. 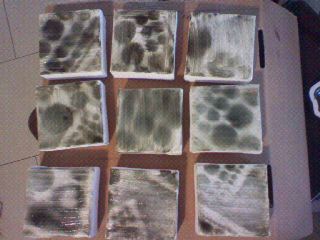 I gesso'd the entire thing, and it looked so fantastic with the texture beneath it. Of course I didn't take pictures because inspiration hit and I just went with it. 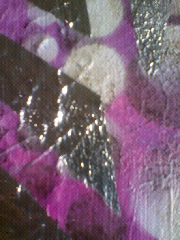 After the layer of gesso dried, I used pink and purple acrylics and painted the background. I love this color combination. I then used my circle stencils and used the Walnut Inks again. Then I used white spray paint and used the circle stencil again. Each time I added a layer I switched the position of each canvas. It was a little dull after the white so I decided glitter was in order. 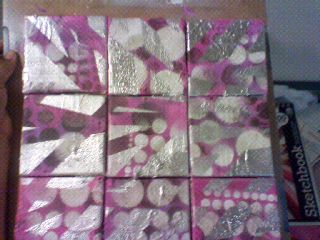 I taped down some masking tape in various diagonal directions and then grabbed my silver spray paint and went at it. I LOVE how it came out!! 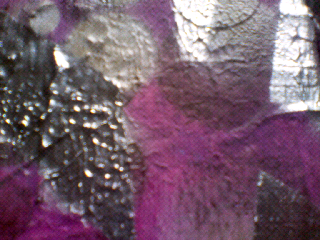 The silver looks like I laid down foil on the canvas! Of course this is just the background of the pieces. 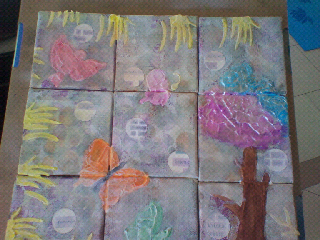 I now will add the messages and embellish my creation. I look forward to continuing this piece. Stay tuned. I plan to offer these for sale once they are complete. Inspiration- what a weird and wonderful thing. Can't wait to see what quote you decide to us. Thank you, yes it is! I finally finished it! I shall blog about it tonight!